I hold it gingerly and give the Ford centrepiece in front of Goodwood House a wide berth in case its sprinklers, which replicate the driving Le Mans rain of 1966, squirt into life again; I'm guessing there's not much call for Scotchguard in Midland, Texas. "Gee, that's a biggie — and it's up to others to say it," grins Hall. "Colin was my idol as I came up through the sport He was original and intelligent I was a customer of his first and then, when I came over to Europe in 1963 to drive [a Lotus 24-BRM] for the British Racing Partnership, I 'competed' against him. I was taken by the fact that he was very closed-mouth. My guys sometimes didn't know how to help me with the car and I went over to talk to Colin a couple of times — and he wouldn't tell me anything. Absolutely nothing. I thought that was interesting, because I wasn't on the same plane as him and Jimmy [Clark]." Hall the designer could keep a secret, too — much was made of his cloak-and-dagger relationship with General Motors. 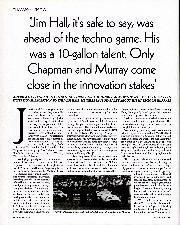 It existed, of course, but GM got as much out of it as Hall did and, like Chapman with Lotus, his team was sacrosanct. 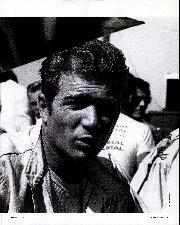 When it came to the racing, Hall made all the decisions. And like Chapman, he was always looking for the Next Big Thing. He regularly found it, too. GM was more than happy to go along for the ride. "Colin and I were fortunate to be involved when the sport could be affected by small teams. The teams today are so huge... but we were taking big enough bites to have an impact. "We definitely got a jump on the competition in the aerodynamics arena in about 1964.I had built a car [the first edition of Chaparral 2] that had bad lift characteristics and I wanted to cure that during the winter of '63-64. I managed to do it. Then I thought, 'Well, if I can eliminate lift, why can't I continue right on through zero and go negative? Why don't I push down on this thing and see if I can increase the traction?' And by golly, I was able to do that, too. 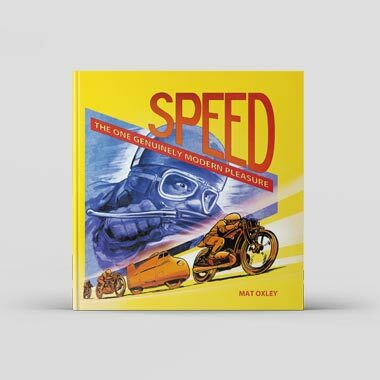 "Then I began to balance the car for high-speed oversteer, because a rear-drive car, if you get it balanced at low speed, if it's neutral in aero, typically goes into oversteer the faster you go. And as I dealt with this problem, the lap times dropped significantly. There was no wind tunnel involved, it was seat of the pants — and some rudimentary instrumentation: we had cables leading to graphs with pencils so that I could plot the ride height I'd calibrate the car by putting lead in it so I knew how many pounds were needed to reduce the ride height by the same amount. "We started measuring drag in about 1965. That's when the movable flaps came in: let's get rid of the drag on the straights but keep the down force in the corners. When we did that, we put so much downforce on the car that we mashed it onto its bump rubbers and into the ground. We were faster still but the ride was pretty bad. That's where the hub-mounted wing came from. It's a pretty logical development: if we are upsetting the chassis why not get those loads off the chassis and put them on the wheels? Gosh, that made for a nice car: the spring rates were reasonable, the ride rate was good — yet you still had the downforce. It was sad that the regs went away from that. But they did — and we did the `sucker car' [the 2J of 1970] as a reaction to that..."
"Initially, I got a young boy's drawing in the mail that showed a car with a fan right in the top of it; he talked about it being a suction fan. That was always in the back of my mind, but when we began thinking about it properly we realised that if you put skirts around the car it wasn't going to take a very big fan to do the job. We finally ended up with articulated skirts that kept a fairly narrow gap all the time. It wasn't a perfect seal — we didn't think that the scrutineers would allow that — but even so, we could reproduce the weight of the car quite easily, and that made it capable of cornering at virtually 2g. It was fantastic. 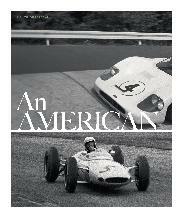 "But at the end of 1970 there was a terrible outcry from the rest of the Can-Am competitors — and the FIA 'bandits' — about our car. They simply told us that we could not run it in 1971 — this after they had banned hub-mounted wings for '70. We had been premature in going to the racetrack with 2J, but when you think you have something that will put you ahead of the field, you are in a big hurry to get out there before any info leaks out. 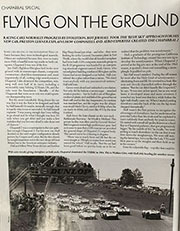 We made a decision to go ahead and do it, learn about the car this year, and win with it the next..."
Like Chapman, Hall was constantly pushing the envelope; like Chapman, he caused rule-makers headaches and, like they did with Chapman, they sometimes refused to rubber stamp his innovations. Chapman never gave up the fight — and worked himself into an early grave; Hall backed away, before returning in a different guise: a team boss miming another constructor's cars. "It took me a while to make the transition forced upon me by my shunt. I did quite a bit of testing for the 1969 season, taking my leg brace off to do so; I wasn't really ready, but I didn't have any other way of doing it: that was the system. I drove Camaros in the 1970 Trans-Am, but it was a mistake; I started too early after my accident, and in a car I didn't have any experience in. "I think it helps you to design if you can drive quickly — Colin was pretty handy behind the wheel. I know that it helped me a good deal: I could get instant feedback and I didn't have to rely on a report from somebody else. That made a difference in the speed of the loop." "It wasn't just in Can-Am, it happened in the international arena, too. 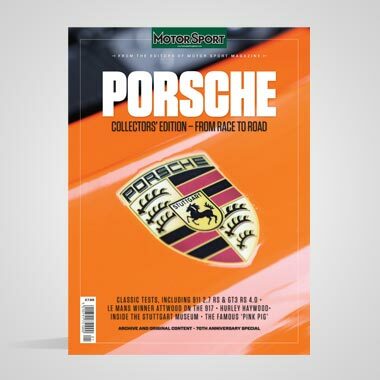 We went to Europe in 1966 and did selected sportscar races — and did quite well. I thought it was something we should stay in, therefore, and so we built 2F for '67. It was the quickest car in the field — but it just wasn't reliable. It was the first time we had put a big-block Chevy in front of the transmission for endurance racing and it just couldn't take it. It took us until the end of the season to fix it. And then they said that we couldn't run the big-block any more. "The big wing, the aluminium big-block, the fan car — everything we had done for the last five years was history. I remember thinking that they didn't want me in this sport very bad. When I went back in, I no longer had the capability of building cars, so I used Eric Broadley's Lolas. We were very successful, and it was fun — but it wasn't quite the same." But then the sport wasn't the same — he and Chapman had seen to that. They'd changed it irreversibly by coupling their need for speed with fertile, imaginative engineering minds capable of forward-thinking lateral leaps. "I started out as a driver in the late 1950s. 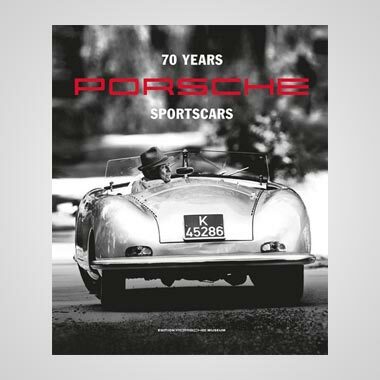 But I started building cars in '62 because we had about half a dozen good sportscar races in the US towards the end of the year. They paid pretty well, but the Europeans would come over with their latest cars and just smoke us. They were always a jump ahead, and I decided that the only way for me to compete with them was to have equipment as good as theirs. 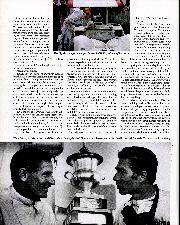 "In the meantime, I got recognised in 1962 because I drove in two Formula One races and finished well in one of them. Ken Gregory [BRP's team manager] asked me if wanted to drive F1. What else is on your mind when you want to be a driver? I wanted to be world champion. I decided to come over and continue the development of our sportscar. "The big problem I had in Europe was that it seemed to rain at almost every race weekend. Maybe five per cent of the races I'd run up to then had been in the rain... My performances were not so good. Because I'd not been as successful as I had hoped, I decided to push forward with my own designs rather than try to find another F1 ride. I've got an engineering degree, but until this point I'd always driven cars designed by other people. It took me a little while to figure out that I could possibly improve them — and then improve on them. "I had my own thoughts, of course, but we also tried to cherry-pick ideas. For instance, we didn't stay completely within the racing community; we went to the aerospace industry for our chassis structure. North American was building the Atlas missile at that time; the Convair was at Fort Worth. Both were using fibreglass epoxy structures. I met a young fellow who had been involved in the design of jet engine fairings, but he wanted to get into the boat business. 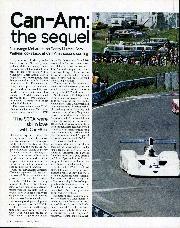 So I helped get him involved in that and we worked together on the design of Chaparral 2. I thought we did a helluva a good job: he knew the structures end of it and stress calculations and I knew where I wanted to place things. That chassis was successful for five years. 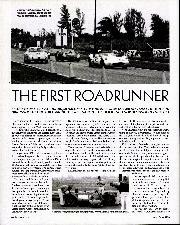 "The car was very light and the best tyres you could get in those days were Dunlops which had about 5in of tread. When you pushed your foot down you would just light them up no matter what gear you were in. Hey, we have too much transmission here. We got a transaxle, turned it upside down and put a little torque-converter in it. After I had started testing it, I was lucky enough to run into a GM transmission engineer who thought it was a great idea; he helped us design Chaparral's so-called auto box. It was just a set of gears and a torque converter; in fact, a single-speed was adequate for those early Dunlops. But by the time 1964 rolled around, we had started working on wider and wider tyres. "I got a deal with Firestone: it would supply us with tyres and we would test them on our skidpan. That was an unusual feature for a team, but I always liked using it because you could pretty much zero everything out, make sure that the car was balanced and that its slow-speed understeer was not too significant It gave you a good baseline without risk or taking too much out of the car. "Firestone sent tyres to be put on 6in rims, but we'd already decided that we needed to go wider to stiffen up the sidewalls, so we built some modular wheels with a variable rim width. We'd run those tyres on 6in, then 7in, then 8in, and it was always better on the widest rim. Firestone realised they had to make a wider tyre. And we'd put that on an 8in, a 9in, a 10in ... In 18 months we went from 5in to 12in — hence the need for two-speed and then three-speed converters. "It was like a normal 'box except you didn't have a clutch. You could upshift by coming off the throttle a bit to release the dog clutches. Coming down, all you had to do was bump the lever into neutral, raise the revs to the right speed and stick it in the next gear. We were totally left-foot braking. I thought of it more in a sense of car control, of being able to place the car exactly where I wanted to be for the exit. Real late braking probably came into being at that time, too. Before that, people used to brake in a straight line and make max-radius corners. In a car with a big engine, that's not the quickest way; if you can make the turn a bit early and start accelerating earlier you exit the corner faster and carry that extra speed all the way down the straight. 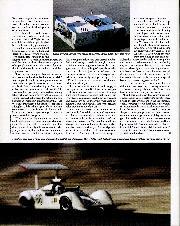 We also used our left foot to adjust the angle of the rear wing via a pedal, balancing downforce against traction." 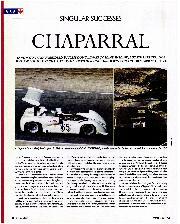 There was one balance, however, that Chaparral did not always strike: head-turning innovation versus race-winning reliability. Can-Am's iconic team won just one victory in that series. "Hap Sharp used to say that you win races in obsolete racing cars. He preferred to drive the more proven models, whereas I took the experimental ones. I was happy to do that because I reckoned the experimental car was usually faster. But I also knew that maybe it wasn't as reliable. We always thought we were going to win, but I think we were out there on the edge, where reliability was not as good. I wanted to win, for sure, and we were always up at the front — on pole or the front row and leading races — and that's where I wanted to be. But the fact we didn't win that much didn't seem to matter." At which point the Hall/Chapman comparison grinds to a sudden halt.